Happy Glitter Me Up Friday! I couldn't decide what to wear today so I made something using a mix of pigments, glitters, tinted base and luster base. 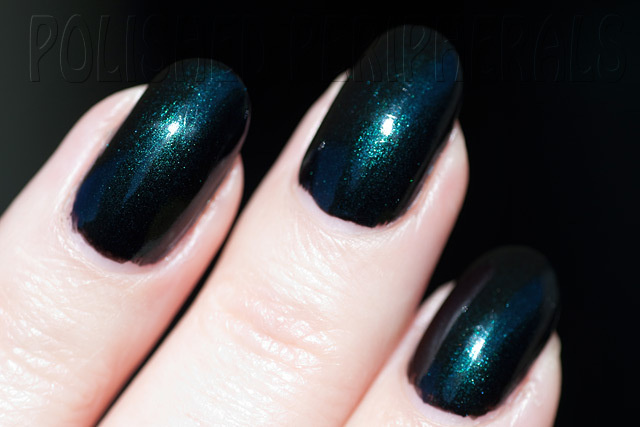 This is a dark teal with green and white glitter. Two coats. Ok so that sounded better in my head. It looks better in real life too. This is my right hand, my left is a bit of a mess right now, which means I had to take these photos left handed. Shooting with a heavy full frame DSLR left handed is very difficult and my P&S camera just isn't as good. The glitter is subtle and the colour is quite pigmented. I wanted a polish that was opaque enough I could wear just 1 or 2 coats without 'underwear' but still wanted the glitter to show through. I have a couple of multichromes that seemed very similar so I decided to wear them together for comparison. Turns out they are identical. 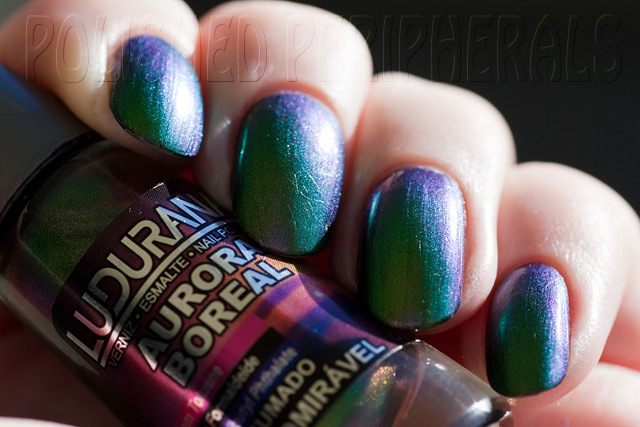 This is Ludurana Aurora Boreal Admiravel and Hits Mari Moon Chameleon. Each can be opaque in 3 coats on their own but I wore them over black. The Hits is on my index and ring finger and Ludurana on my middle and little finger. I actually prefer the way these look without the black underwear but they are such small bottles I thought the black would let me compare the colours without using too much of them. I still ended up doing 2 coats of each. The only real difference between them is Admiravel seems to be subtly scented and Chameleon has a dodgy brush. 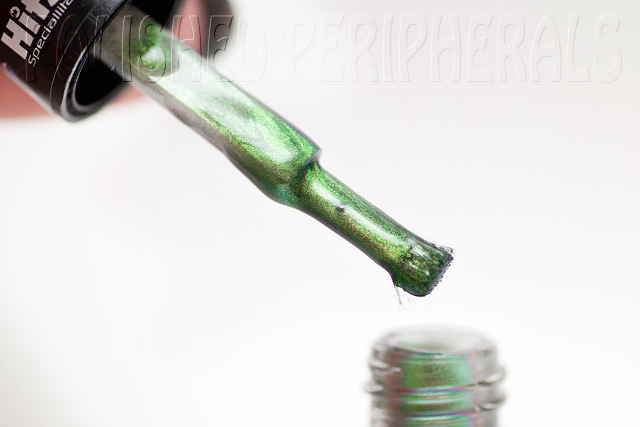 Actually all my Hits polishes have bad brushes, like they are melted on the ends. This one is at least usable but messy. I can see more brush marks on the Chameleon nails but I think it's due to the brush. These photos are all taken outdoors in a mix of sun and shade. I took a lot of photos to try and catch the colour changes. Please excuse the weird angles and dry skin. There's been a bit of sickness in the family lately which means a lot of hand washing and sanitising gel, which is really harsh on my skin. 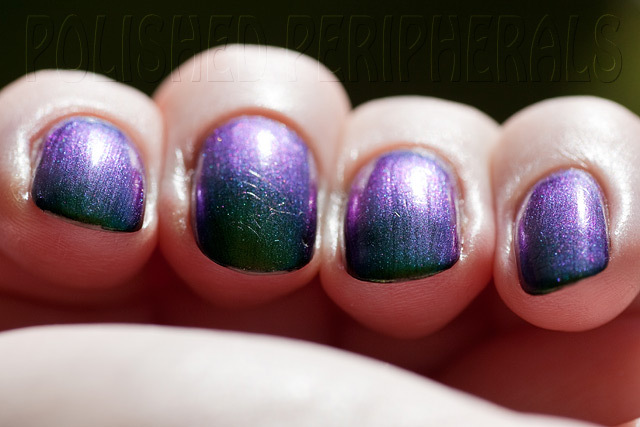 There's some scratches and dents in the polish too because I took the photos on the second day of (hard) wear. 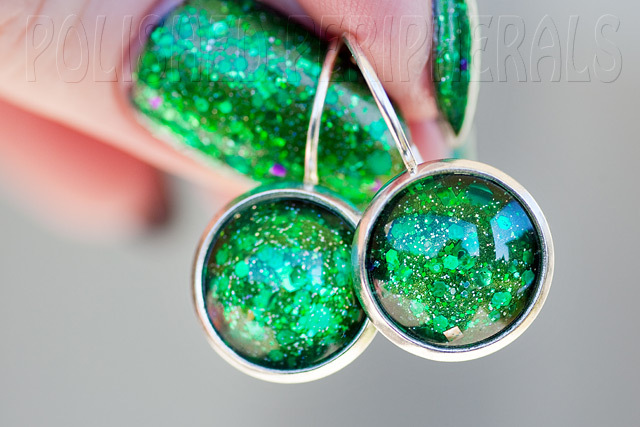 I love the range of colours in these polishes, especially the rich emerald green. There's shades of copper, gold, purple and blue too. 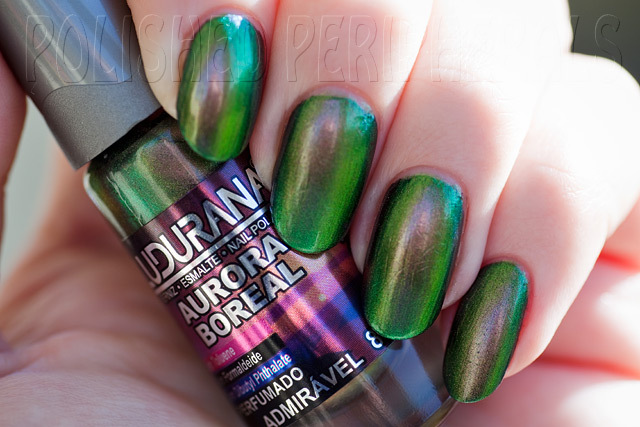 Of the two I prefer Ludurana Aurora Boreal Admiravel. It's a bigger bottle (8ml vs 6ml) and it smells nice. The HITS Mari Moon Chameleon has that weird melted tip brush and the name rubs off the label, which is on the lid so you can't avoid handling it. It's a stunning green, actually what I consider a perfect Christmas green. 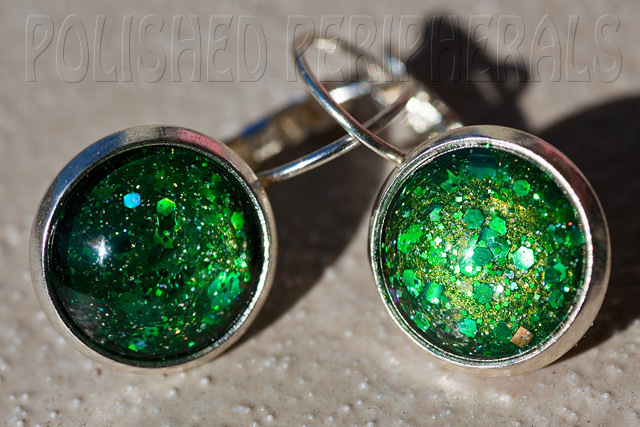 It has a range of different green glitters with some random purple and gold glitters. I love those random colours. The purple and gold look so good with this rich green. I layered two coats of I Can Afford It! over 2 different green multichromes I was testing yesterday and they are over black. Hence the growth gap, my nails grow so quickly. 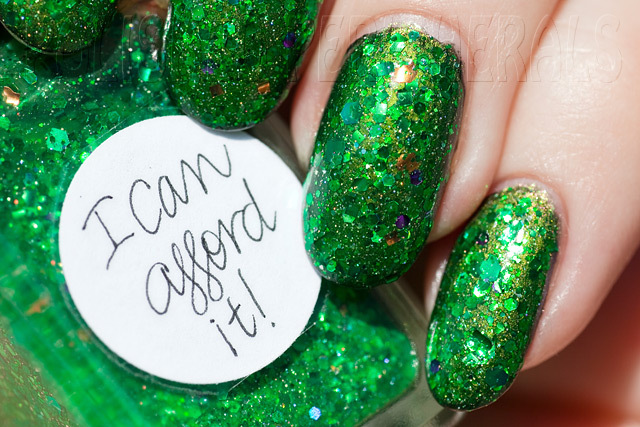 I'll do a separate post about those greens later, they deserve it :) Really, I Can Afford It! looks pretty amazing over anything. I've tried black, red, blue, purple and so many different shades of green. It went on smoothly, no dabbing needed to spread the glitter and I finished with a coat of Gelous and a coat of Seche Vite. The only rough bit left is a piece of square glitter on my little finger nail that is curled. This survived a long hot shower this morning, (trying to steam my sinuses) and a vigorous hair wash, a knife across my nails while making packed lunches and a burn while cooking home lunches. So I'm pretty sure it's set strong and undentable and I'll probably get sick of the thickness on my nails long before this chips. I loved the look of this so much I made some earrings to match. Here's a little layering combo I wore last week. I took photos but just didn't get around to blogging about it. I started with Picture Polish Berry Nice, one of the discontinued polishes I picked up in their Goodbye Shades sale. I love Picture Polish so grabbed most of the goodbye shades while I could. I've been really impressed with all of them. Looks like Berry Nice has gone now but there's still some other colours left worth grabbing. Berry Nice is a gorgeous soft muted purple colour that dries to a velvety smooth matte finish in just one coat. I did 2 coats though, just because I usually do. 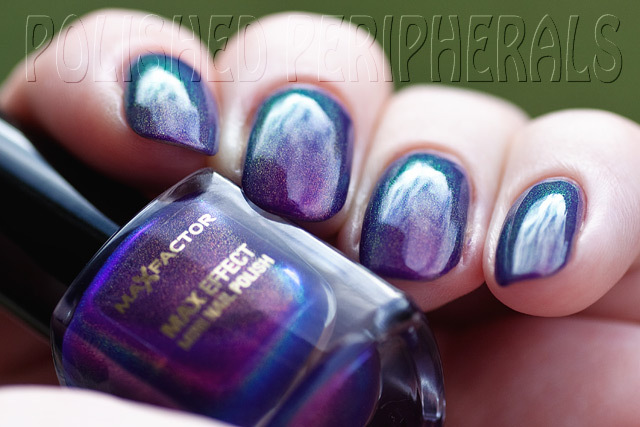 I'm not a fan of matte finishes but this is beautiful and with Picture Polish quality, what's not to love? It's a really nice matte, not at all rough or dry feeling. It looks elegant and classy with a finish I can't stop touching. I wore this for a few days without a top coat and had no problems with chipping or cracking but then my aversion to matte became too strong to ignore. Matte finishes are just too much like house paint on my nails and I've painted a lot of walls in my time. Without top coat it also made my ridges a bit too noticeable. Sorry my skin looks so dry. I didn't put any hand cream on before I took photos because I didn't want to spoil the matte look. Now I could have just put a glossy top coat on and left it for a few more days but I was ready for a change and Berry Nice looked like a good base for Max Factor Fantasy Fire. I tested it on a nail wheel and loved the look with just 1 coat of Fantasy Fire but when it came to my nails 1 coat looked streaky over the lighter base. So this is 2 coats of Fantasy Fire over 2 coats of Berry Nice. I love Fantasy Fire and I'm fortunate enough to have a backup already (thanks Louise!). I also have a bottle I made myself before I got Fantasy Fire using pigments and colour morphing powder. It's pretty much a perfect match. In the bottle mine looks bluer and on the nails mine has a little more colour shift but it's nice to know I can dupe the look when I run out of Fantasy Fire. I should have taken a photo of my homemade version, maybe I'll do some comparison photos later. Look at the colour shift! Mostly pink and purple then at extreme angles I can see blue and green. So beautiful, shiny and mesmerizing in any light. This lasted a few more days until I had a marathon bathing-the-kids-with-lots-of-bubbles session and chipped 2 nails. Now this is Pretty Serious! If you haven't seen it yet (you're missing out) Pretty Serious Cosmetics opened their store on Monday. I actually had the page open over breakfast, watching the timer count down so I could shop :) Pretty Serious is the brainchild of Kaz from Pretty Random blog. 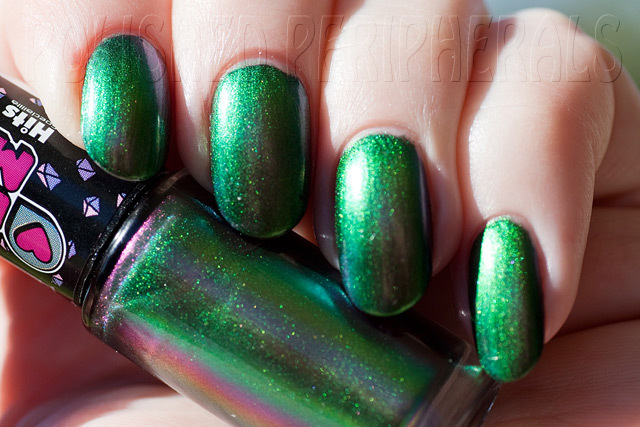 Kaz is one of my favourite nail bloggers, she really knows her polish. It's obvious her Pretty Serious products are well thought out right down to the cutest packaging. There's nail polish, loose eye shadows and lip gloss and everything is vegan, cruelty-free, big 3-free and formaldehyde resin free. I couldn't wait to get my hands on her polish. I have 3 bottles of polish from her inaugural 'Hello World!' collection and now I've tried them I can't wait to get the rest. The colours are stunning, they apply beautifully, dry fairly quickly and so far no chips (I'm on day 3 of Tux which Kaz sent me pre release). I love the bottle shape, it's just like the square Bloom bottles, the brush is perfect, the lids are a nice grippy soft touch and each polish comes in the cutest box. The colour names are clever and the service is great. I ordered Monday morning and they were here the next day. I'd love to try some of the eye shadows and lip gloss too but I spend all my (husbands) money on polish so for now I have Tux, VT100 and BSOD polishes. I'll comment on the others later but for now here's some pics of Tux. I noticed a purple duochrome effect in the bottle and it's very subtle on my nails, just visible at the right angle, but couldn't pick it up with the camera. 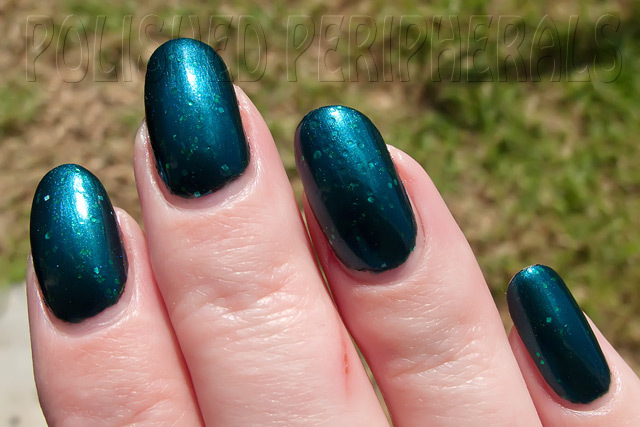 Mostly it's all about the teal shimmer. It went on smooth. I did 2 coats but some nails looked good with just one. The brush worked well and the formula was perfect. I don't do acetone clean up on my nails so with dark polishes messy brush strokes can be very obvious but this was easy to control. I've been wearing this for 3 days so far through cooking, cleaning, typing, hair washing, can opening and kid wrangling, with no chips or cracking. I don't want to take it off but I can't wait to wear the other colours. Look how cute the packaging is. I believe the name Tux is a reference to the LINUX penguin. Something I saw a lot of around 15 years ago. I'm really out of touch with Linux these days but I still remember a Tux soft toy or 2 sitting in the computer room. This is 2 coats of Kleancolor Holo Chrome over 1 coat of Kleancolor Cobalt. Holo Chrome is nicely opaque on it's own in 2 coats and can look quite purple but I wanted to enhance the blue so I started with a layer of Cobalt. Cobalt is a great blue to use as underwear, it's rich and opaque in one coat. The only problem I have with these Kleancolors is they stink and take a while to dry. Once the Kleancolors were finally dry I added a layer each of some cheap polishes I found at the markets called LDM Glitter Shine in #65 and #66. I don't know anything about this brand (and the bottles are too tall to fit in my Helmer). 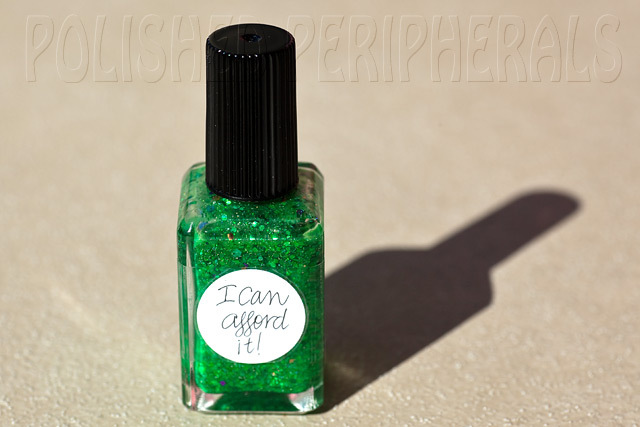 #65 is iridescent micro glitter and small hexes in a clear base. 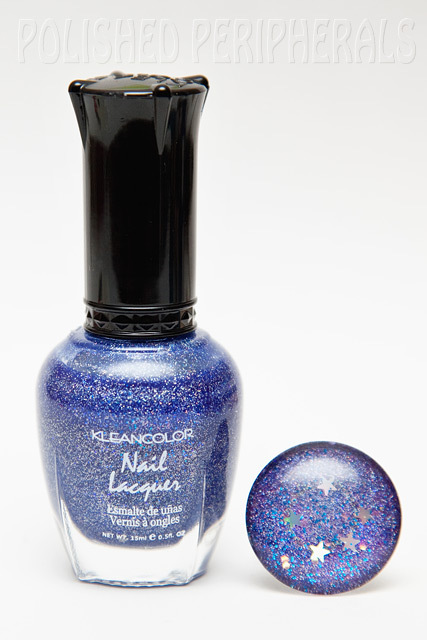 #66 is blue micro glitter, small gold hexes and holo silver stars in a clear base. Both are sparse enough they can add a nice glitter accent layer without overwhelming the base polish and both are thin enough that the 2 extra layers don't make my nails feel overly thick. It did take a bit of work to fish the stars out though. 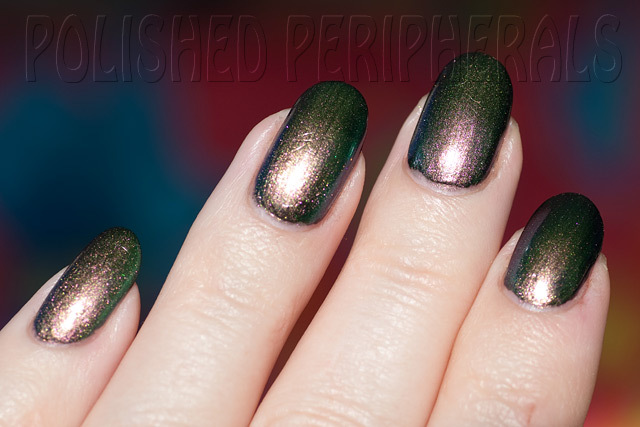 Then I finished it off with INM Out the Door Northern Lights Hologram Top Coat Gold. The length of that name always makes me laugh but I love the extra sparkles Northern Lights gives my nails, and it's quite a nice top coat, not at all thick and dries reasonably quickly. I love the silver version too. This combination sparkles like crazy. 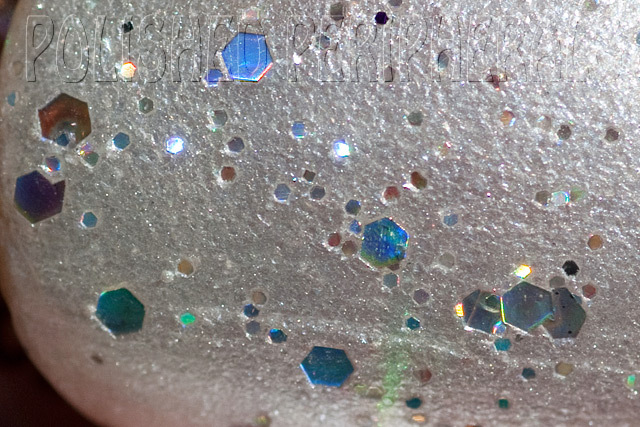 Actually the Holo Chrome does a pretty good job on it's own but I love the effect of the additional layers, my own starry sky. I was so pleased with the result I made myself a ring to match. On the afternoon walk to pick my son up from school the sun was out and my hands were covered in rainbows :) I didn't use Kleancolor Cobalt as the base on the ring, I just finished it off with black (the rings layer in reverse) so you can see it's more purple than my nails. 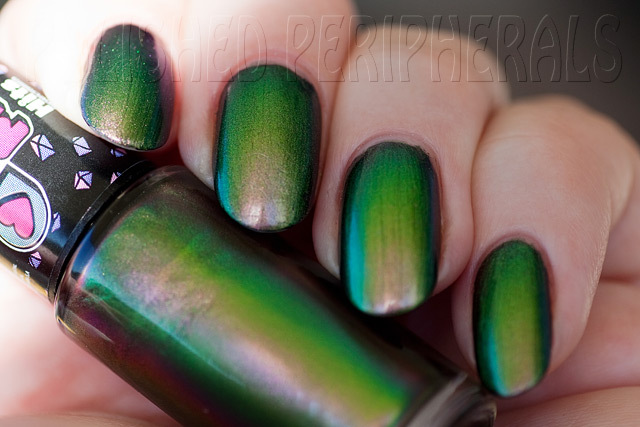 I have a really special new polish I'm looking forward to wearing this weekend and blogging about. I'm also looking forward to Mother's Day :) I doubt I'll get breakfast in bed though, we're spending the day with my mother-in-law. These polishes are all beautifully smooth, opaque and streak free. I've never met a Picture Polish I didn't like, I love the bottles, brushes and polish :) The big surprise was Berry Nice. It dries to a soft matte finish. A velvety smooth matte. It's soft and subtle, not at all rough and dry. I can't stop touching it, it's so soft, and I don't even like mattes but I love this. So for Glitter Me Up Friday I chose one of my new Picture Polishes and one I've had for a while. This is 1 coat of Glitter Ball over 3 coats of Simply Silk (with a top coat between 2 and 3 because I had to go out). It's getting cold in the mornings here so I wanted an icy Wintery look and after wearing my husbands brown franken last week I needed a palate cleanser. 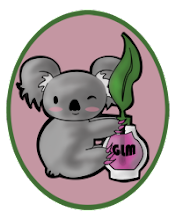 Simply Silk is one of the discontinued colours you can grab now for just $6. It is soft silky perfection with a finish that shines just like a pearl in shimmery silver white. Really quite stunning. I can't stop looking at it. In bright light it's shiny but in low light it seems to have a light all of it's own, it really glows! How can something so colourless be so eye catching, and how do they make it glow like that, and why is it being discontinued? 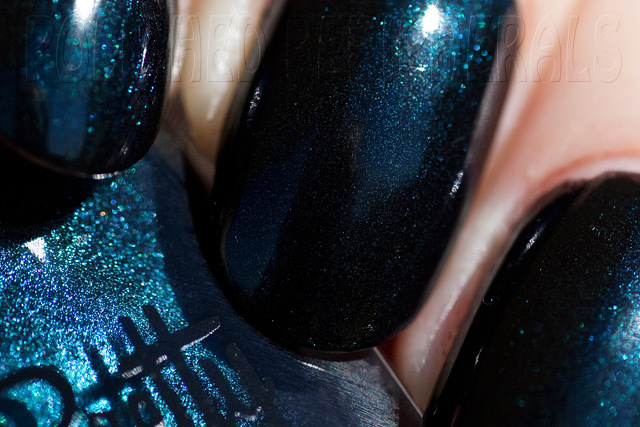 Simply Silk is one of those polishes that will show brush strokes, it's just that type of finish. I found thin coats with even brush strokes worked best. The finished result looked great but I knew the brush strokes would stand out with the macro lens. Not a problem though because I'd planned my glitter layer. I've found that a top coat can make a big difference to these types of polishes It can have a minimising effect on the visible brush strokes, and it doesn't have to be a clear top coat, special effect top coats like the CND Shimmers or a clear based glitter work just as well. In this case I used Picture Polish Glitter Ball, a clear with small and fine, silver holographic glitter. I used one coat for a subtle (work safe) sparkle but Glitter Ball is thin enough that you can easily build up more layers for extra bling without bulk. I love Glitter Ball, it's that prefect finishing touch and I love that it is sparse enough that it enhances, not hides, the colour underneath. It can look amazing over bright or dark colours or soft and pretty over pastels. Look at the pretty glitter. I love the way it looks like it's sinking into the polish. It's not at all, the Simply Silk was completely dry when I applied Glitter Ball, so the sinking is just an illusion but it looks so squishy. 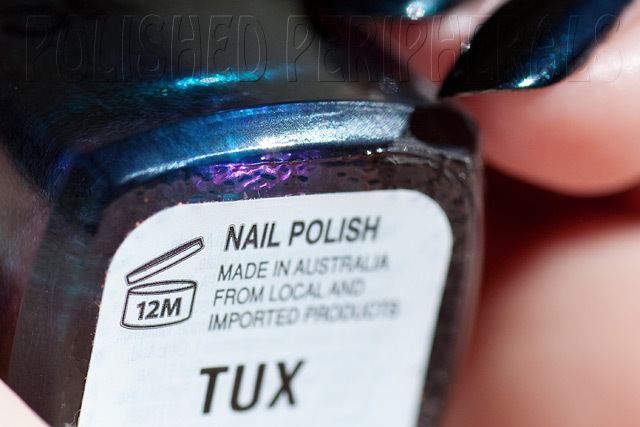 Picture Polish is available from http://www.picturepolish.com.au and the customer service rocks! 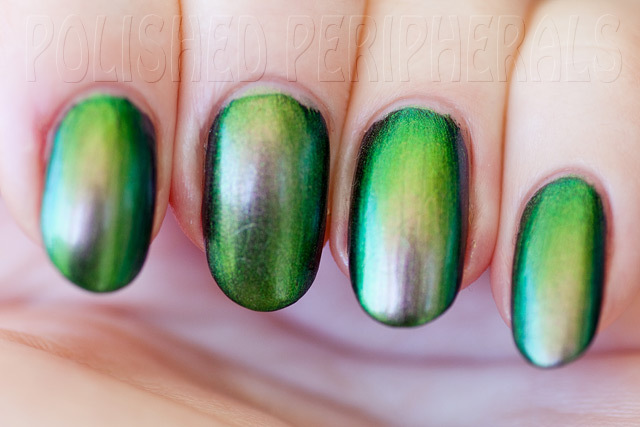 They do ship internationally but are also available from International Network Members, have a look here http://www.picturepolish.com.au/information.php?info_id=11 to see if there is one near you. I had a new photographers assistant today. Well actually he wasn't much help, he just followed me around waiting for attention. This is Crichton, (named from Farscape) my parents cat who is staying here while my parents are in Sweden. He was originally my cat, we adopted him as a rescue when he was 12 weeks old (8 years ago), but when I had my first child Crichton went to live with my parents. 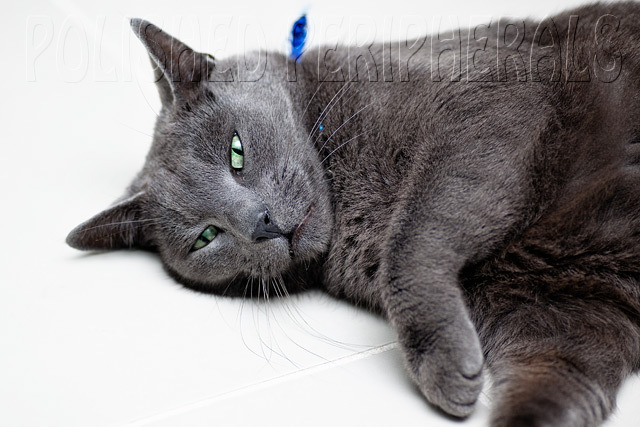 He is a timid cat and doesn't like children, especially screaming babies. It's nice having him 'home' and he is being surprisingly good with the kids, even letting them brush him, but he is a big sook and keeps a low profile until the kids are in bed and he can relax a bit. He follows me everywhere and keeps flopping on the ground waiting for a belly rub. I think he was quite fed up with me taking pictures because he wasn't getting any pats. This is his 'hurry up and pat me already' look. 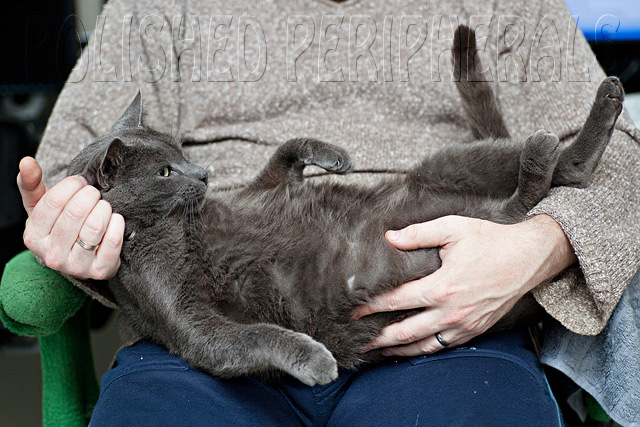 He is happiest when cradled on his back, my husband used to hold him like this as a kitten but Crichton is a bit more of an armful now.